Successfully Added Kids Pink Cellphone - Simple And Safe Mobile Phone to your Shopping Cart. 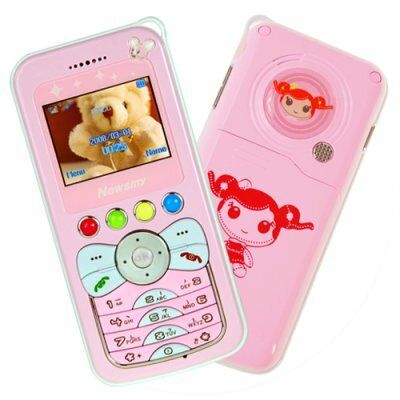 Kids Pink Cellphone - Simple And Safe Mobile Phone for your star child. This easy to use quality cellphone is a dual-band (900Mhz, 1800MHz) GSM mobile with family phonebook, white list and parental call setting features. Give your daughter a fully functioning cell phone without worrying about who they are talking too. Simply set up the mobile with the family and friend phone numbers and in a short time you will have safe contact list which they can call (send and receive calls). Give you and your loved one piece of mind by keeping them only a phone call away! Newsmy is one of the top brand mobilephone and portable electronics manufacturers in China. We are happy to offer this model to our wholesale customers. You will find the quality of this brand to be as good as anything you could get from Samsung, HTC, etc., but at a much better price. The CVFV-M07 child friendly mobile phone is proudly brought to you by Chinavasion Electronics. Order your stock now at a great wholesale price. Dual-band (900Mhz, 1800MHz) GSM mobile with family phonebook, white list and parental call setting features. NOTE: This product is compatible with GSM at the frequencies of 900MHz, 1800MHz. This cellphone will not work in North America. Resellers: Other popular names for this phone include "Barbie Phone and "Girls Pink Cell Phone"
This is a dual-band mobile phone that will work in Europe and some other parts of the world. Please check the link above to GSMWorld if you have questions about which band(s) your carrier uses.